Signing the orders, Mr Obama said the US would continue to fight terror, but maintain "our values and our ideals". He also ordered a review of military trials for terror suspects and a ban on harsh interrogation methods. Continuing a flurry of announcements, he named his envoys to the Middle East, and to Afghanistan and Pakistan. At Mr Obama's request, military judges have suspended several of the trials of suspects at Guantanamo so that the legal process can be reviewed. Mr Obama signed the three executive orders on Thursday, further distancing his new administration from the policies of his predecessor, George W Bush. He said the Guantanamo prison "will be closed no later than one year from now." The US would continue to fight terror, he said, but maintain American values while doing so. "The United States intends to prosecute the ongoing struggle against violence and terrorism," he said. "We are going to do so vigilantly, we are going to do so effectively, and we are going to do so in a manner that is consistent with our values and our ideals." Mr Obama believed Americans will be safer with the prison closed, White House spokesman Robert Gibbs said in his first media briefing. Mr Obama has repeatedly promised to close the Guantanamo Bay prison, where some 250 inmates accused of having links to terrorism remain and 21 cases are pending. The legal process for these prisoners has been widely criticised because the US military acts as jailer, judge and jury, the BBC's Jonathan Beale reports from Guantanamo. However, closing the prison will not be easy, he says. Questions remain over where those charged will be tried and where those freed can be safely sent. Secret CIA "black site" prisons around the world are also to be closed, although the time frame for this is unclear. 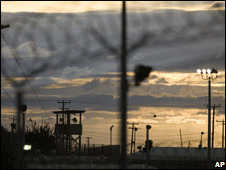 The rendition - or transfer - of terror suspects to these prisons was widely criticised after they came to light in the wake of the invasion of Iraq in 2003. Mr Obama has also limited the methods investigators can use to question terrorism suspects. Threats, coercion, physical abuse and waterboarding are now all banned. 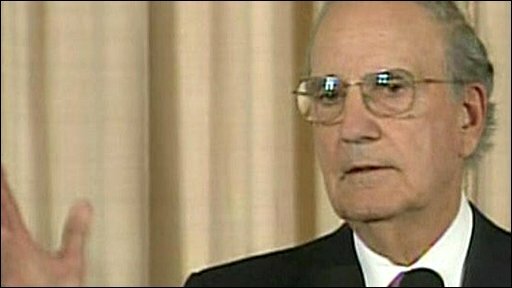 Continuing a day focused on national security and diplomacy, Mr Obama said veteran politician and deal-maker George Mitchell would head to the Middle East as soon as possible, in an effort to pursue a two-state solution to the Israeli-Palestinian conflict. Mr Mitchell is a former senator who under former president Bill Clinton chaired the talks that led to the Good Friday Agreement in Northern Ireland. Long-serving diplomat Richard Holbrooke was appointed US envoy to Pakistan and Afghanistan and charged with leading "our effort to forge and implement a sustainable approach to this critical region", Mr Obama said. The announcements were made at by Secretary of State Hillary Clinton, flanked by Mr Obama and his Vice-President Joe Biden. Mrs Clinton had earlier arrived at the state department for her first day on the job, where she was welcomed by applause and cheers from staff members. She said it was a new era for America. "President Obama set the tone with his inaugural address, and the work of the Obama-Biden administration is committed to advancing America's national security, furthering America's interests, and respecting and exemplifying America's values around the world." Earlier on Thursday, the Senate Finance Committee approved the nomination of Timothy Geithner as Treasury Secretary, despite questions over his late payment of taxes earlier this decade. The full Senate next votes on Mr Obama's choice to be the point man in steering America through its sharpest economic downturn in decades.